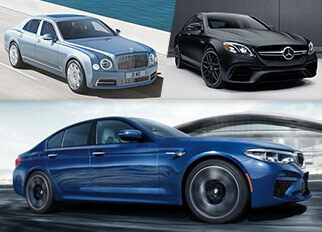 Luxury cars Dubai market every year has amazing, thrilling and the most exquisitely designed luxury cars launching. Being the pioneers in luxury cars industry, Mercedes-Benz, Bentley and BMW have a lot to offer to the car enthusiasts of Dubai. We have listed 3 of the top luxury cars Dubai with powerful Twin-Turbo V8 engine sedans, which are a step ahead in the segment, combines luxury, performance and comfort at one place. Here is a brief review of top 3 sedans from 2018 available in the UAE car market. 2018 Mercedes-Benz AMG E 63 S is a versatile luxury sedan with amazing performance attributes combining elegant exterior with muscular fine edges. 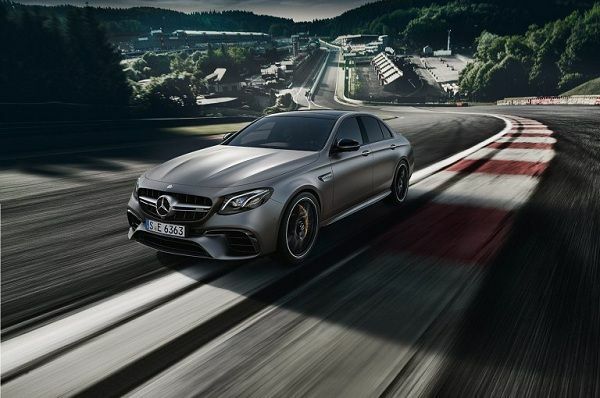 The all-new AMG E 63 S has AWD system and a powerful Twin-turbo V8 engine, advanced safety features, driving assistance features and much more to make your ride entertaining and smooth no matter what the road conditions are. The AMG E 63 S is the 10th generation sedan by Mercedes-Benz which provides sheer luxury and amazing performance to the passengers. This premium luxury sedan has supreme design and luxurious interior as well. The coupe-like roofline and sporty design elements add more versatility to this sedan. Designers at Mercedes-Benz have demonstrated the best of their design aesthetics while styling this AMG. The extra-large air intakes, a wing front air dam, chrome diamond block grille, AMG Sport Exhaust System with bright tailpipes and 5-spoke alloy wheels are designed so stylishly that it makes the onlookers give a second look at it again. The interior is ergonomically designed with fine materials and luxurious styling. With a long wheelbase, it is very spacious and comfortable for the passengers and provides ultimate comfort during the ride. An exquisitely stitched dashboard in MB-Tex material, power tilt/sliding tinted glass roof, Nappa Leather upholstery and advanced driver assistance features make this sedan worth every penny. This one of the top luxury cars Mercedes-Benz vehicle is fitted with the newly engineered version of AMG Performance 4MATIC+ All-wheel Drive System for optimized handling and acceleration by efficiently distributing torque among wheels. The 4L V8 twin-turbo engine paired with AMG SPEEDSHIFT MCT 9-speed sports transmission gives an exhilarating performance. The engine generates 612 HP and 850Nm of torque, which is greater than any other luxury cars Dubai E-Class sedans. It also has AMG Dynamic Select System, AMG Sport Suspension based on Air Body Control, Electromechanical Power Steering with Direct-Steer and AMG Electronic Limited-Slip Differential System to provide the driver with ultimate control over the vehicle and pleasure while driving this car. The 2018 Bentley Mulsanne is British car maker’s premium luxury car which is equally popular in luxury cars Dubai market. The Mulsanne is handmade and finely well-crafted from the scratch and has a very intricate design. With an aerodynamic body and athletic looks, the body of this luxury sedan is made around a solid steel structure, ensuring more safety of the passengers. A powerful engine, dynamic and superior performance attributes, both interior and exterior reflecting sheer luxury make this sedan among the top luxury cars Dubai segment. The exterior of new Mulsanne is built upon previous design modifications until now. With a unique design reflecting a perfect blend of wind tested planning techniques, modern aerodynamics ad vintage luxury car identity, reflects the design philosophy of the Mulsanne. A sharply defined edge on front fascia with unique bonnet signature and V-shaped lines extending to front fascia from the windshield provides a muscular stance of the vehicle. Most of the design schemes of 2018 Mulsanne has dual tone component making it look extraordinary and luxurious from every angle. The stainless steel radiator grille is bigger and wider than previous models, while the integration of grille with lower bumper has made it look larger. As the new bumper looks wider, it has more weight as well, but it is designed as to look lower in height but in reality, it is not. LED headlamps which also have smart light mode system and daytime running light function to adjust as per the outside conditions provide more convenience to the commuters. Moreover, it comes with headlight washing mechanism which is a built-in system in all Musslane cars. The flying B shaped rear taillights are found next to side fenders providing enhanced engine cooling system. An optional 21-inch aluminium alloy wheels with further customization as per choice lets you have a more intricate exterior of the car. Just like the exterior, the interior of new Musslane is lavish and furnished with the finest wooden rims and fabrics. The veneer options for wooden trims include Dark Stained Madrona and Liquid Amber. The cabin looks more like a luxurious office as it contains luxury materials, side panels, centre console and other features with more of an executive styling. The 8-inch touchscreen display, Apple CarPlay, Android Auto and many other latest technologies are found in Musslane too. The 6.75-litre Twin-Turbocharged V8 engine of Musslane provides rugged powertrain which is not available in this segment of luxury cars Dubai. It is capable of producing 505 hp and 752 lb-ft of torque. While the 2018 Musslane can reach from 0 to 100 Km/h in just 5.3 seconds and has a top speed of 184 mph. The 2018 BMW M5 is a midsize luxury sedan powered by a TwinPower Turbo engine. The new M5 has exceptional performance attributes, advanced technologies, driver-focused luxuries and also a Carbon Fibre Reinforced Plastic roof which makes this vehicle lightweight. The exterior of 2018 BMW M5 is redesigned, front fascia has large air inlets placed on the lower side of front bumpers. Also, it has power-folding heated side mirrors, weight-optimized exhaust system, quad tailpipes, and M rear spoiler enabling the sedan’s body design to look aggressive yet smooth at the same time. The iconic BMW twin-kidney shape grille is there to make the look of this sedan impressive and superior. Moreover, the overall look of this luxurious sedan is more sports car like and has 19-inch double spoke bi-colour light alloy wheel, providing a strong grip on the ride while maintaining a smooth drive. An ergonomically designed interior makes the new M5 a true example of BMW’s craftsmanship among other BMW luxury cars Dubai. The spacious cabin has seating capacity for up to 5 passengers. The Merino leather upholstered seats and aluminium carbon structure reflects more sophistication. The all-new BMW M5 has a 3-spoke leather trimmed M steering wheel having driver’s assistance features enabling the driver to control all the technological features available. A 12.3-inch Dynamic Digital Instrument Cluster shows information in the form of a digital display so that the driver can have the knowledge of all functions available in the sedan. The technologies of the M5 does not end here, it also has an automatic climate control, micro-filter ventilation system, an active-control charcoal filter that maintains the clean environment inside the cabin. The seats are 6-way power adjustable and front seats have 3-stage heated technology and the rear seats have 40/20/40 split down fold to provide extra cargo space. It has a 4.4L TwinPower Turbo V8 engine capable of producing 600hp and 750Nm of torque. Also, it comes with M-specific integral-V multi-link aluminium rear suspension and M-redesigned double-wishbone multi-link aluminium front suspension. This luxury sedan’s suspension system is paired with electronically controlled dampers to provide more stability during different road conditions.